Creative collaborators Alexis Deacon and Viviane Schwarz were behind the wonderful ‘A Place to call Home’ plus many other clever picture books. 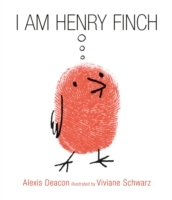 ‘I am Henry Finch’ is a funny and original take on the philosophy of Descartes… ‘I Think Therefore I am’. One day, the repetitive rhythm of the Finch flock’s existence is turned upside down. Little Henry Finch is suddenly struck by A Thought. The Thought changes everything… in fact, Henry’s Thought saves the day, and before long, the whole flock are buzzing and chattering with Thoughts! Fabulously funny, quirky and intelligent picture book, perfect for 3 to 6 year olds, whether budding philosophers or not!